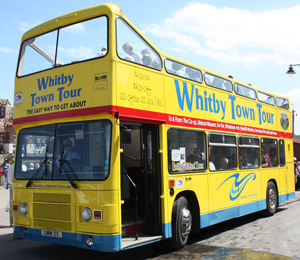 Hop on to our open top bus for a unique sightseeing tour of Whitby. You will get a bird's eye view of this beautiful North Yorkshire seaside town from our distinctive Double-Decker open top bus as it follows its feature-packed sightseeing tour of historic Whitby. 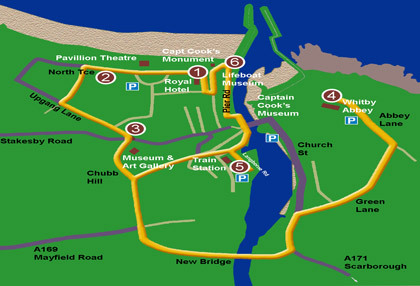 Our local guides will take you on this trip around Whitby - you can hop on and off the sightseeing tour as many times as you like - whilst you enjoy magnificent seascapes and experience Whitby's narrow winding streets as the open top bus climbs steeply up to the impressive ruins and new visitor facilities of Whitby Abbey. 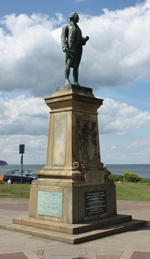 Hear Yorkshire tales of bygone days and find out about the Whitby man who had 21 children twice or the man who was the only survivor of the lifeboat disaster of 1861, both immortalised by the camera of Frank Meadow Sutcliffe. If you have brought a coach, school or other large party to Whitby why not book our double-decker open top bus for your exclusive sightseeing tour. Contact us now for further details and prices. The open top bus is also great for use at special events such as when used for the switching on of the Christmas lights in Stockton with Middlesbrough FC footballers, Keith Harris and Orville - even a pantomime dame joined in the festivities! The potential uses are endless; contact us now to discuss your requirements. * This service departs after a 30 minute legal drive break. Please note the correct departure time.